Wow, this has been a very productive day. I not only sold three of my dresser make-overs yesterday, but sold three more pieces today. And one person who bought yesterday, emailed about having another piece done for her! On top of this, we worked on the Kid’s bedroom today, or to be more exact, on his bed. I had a specific look in mind and missing just the ‘perfect’ bedding, I think we got it done today. First, let me apologize that, again, I didn’t get enough pictures. I did better than usual, though… I’m trying! The bed is essentially three parts: the narrow headboard, the wider side (right) board and then the L shaped frame on the left and bottom of the bed. 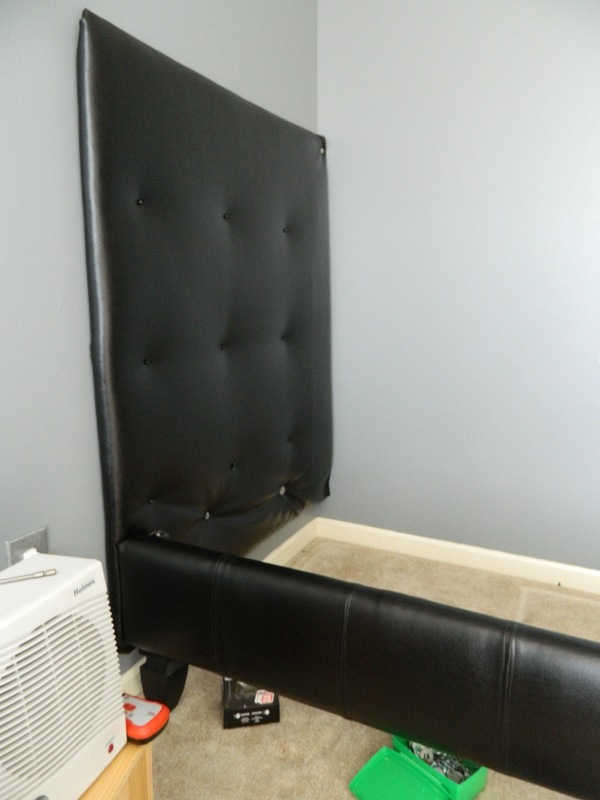 We started by placing the head board against the wall and then placed the L-shape right up to it to give us the necessary height. It was then screwed into place. 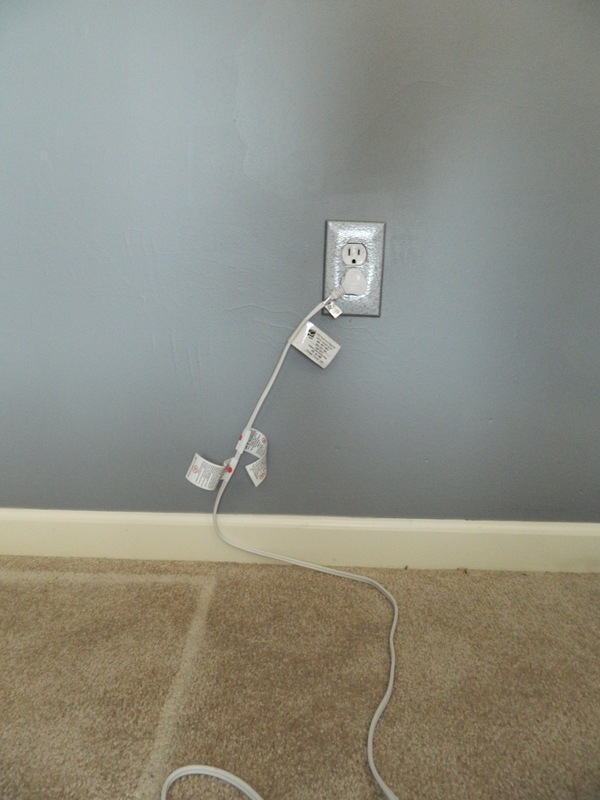 The Kid’s room is fairly shy of electrical outlets and I knew the bed would go across one, so I put in a flat-head extension cord so that we could still use at least on outlet. I plugged it in and then just set it aside. I almost forgot to tell you about the feet on the L-Shaped unit… I had been looking for something that would give me a relatively short rise, but everything I was seeing was either too feminine (like round or frilly) or too short or just way too expensive. Some were as high as $30 a piece, and I needed 3! As the Kid and I were walking through Home Depot brainstorming, I caught out of the corner of my eye these lovely pieces. They are the newell posts for outdoor fencing and there were just three – enough for the project. And when I found the price, I couldn’t believe my eyes! They were only $2.99, so I got all three for less than a ten spot! Painted them black and they were ready to go. 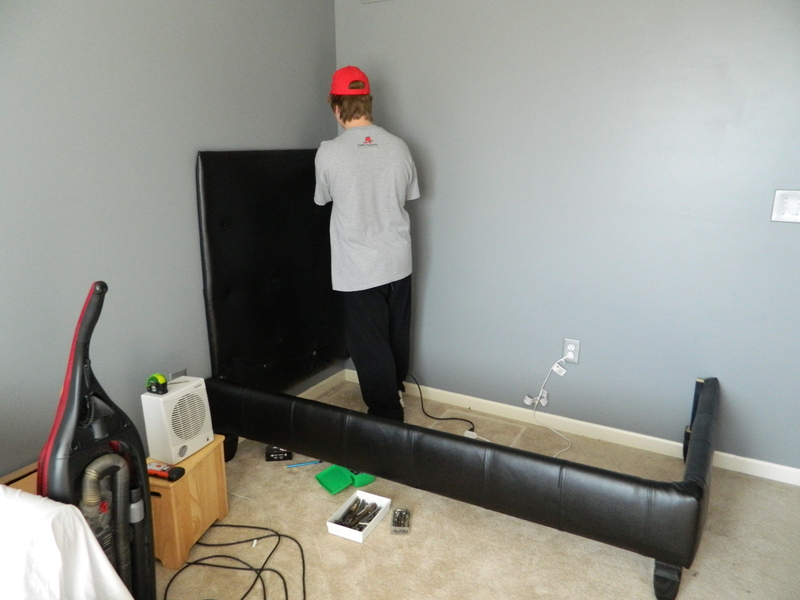 Next we put up the long padded/tufted piece against the back wall. We struggled with this a little more, but in the end, we got it to work. Then it was just a matter of attaching the L-shaped piece to bed and the wall. 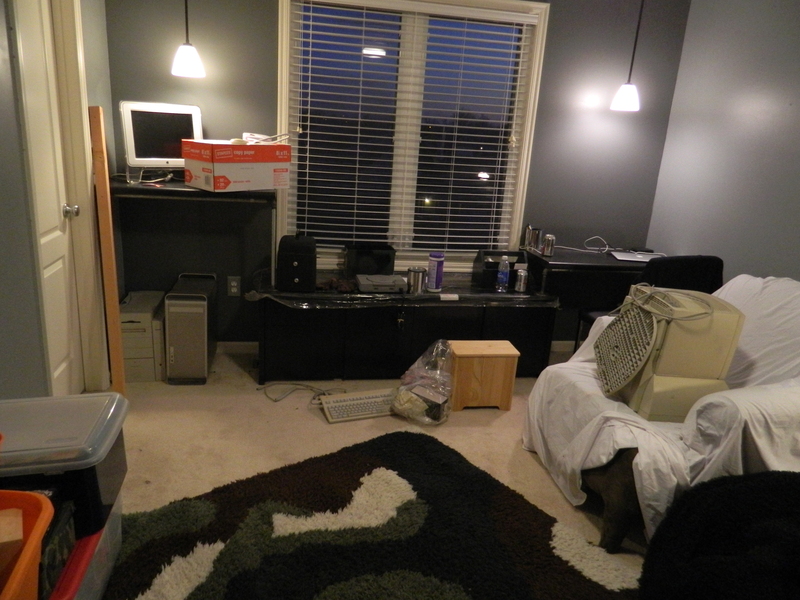 Thankfully this wasn’t the prettiest installation, but most of it will be hidden by the mattress and/or the bedding. Here it is after we screwed into place the cross pieces to support the mattress. 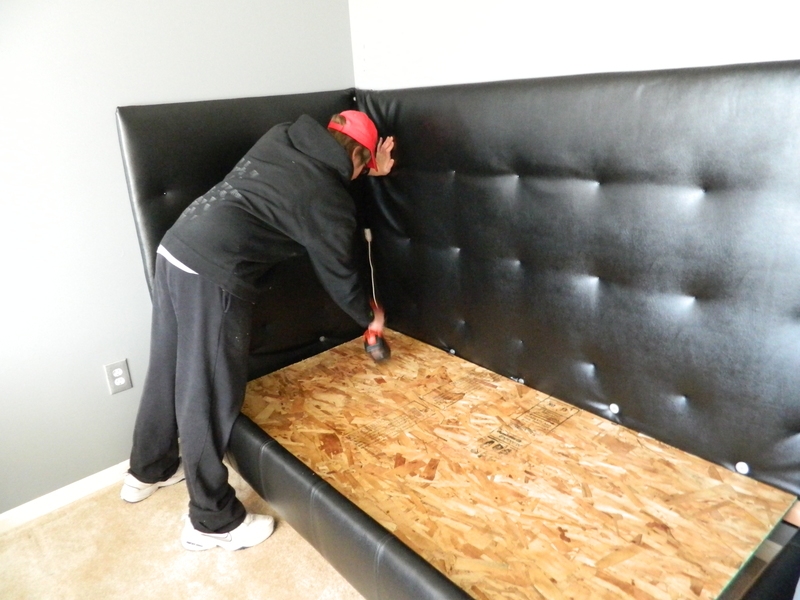 We could have done without putting down a full sized board just resting the box spring on the boards or even just using slats, but I didn’t want to chance it. Luckily I had a full sheet of pressboard in the garage, which cut down nicely. That was screwed into place. 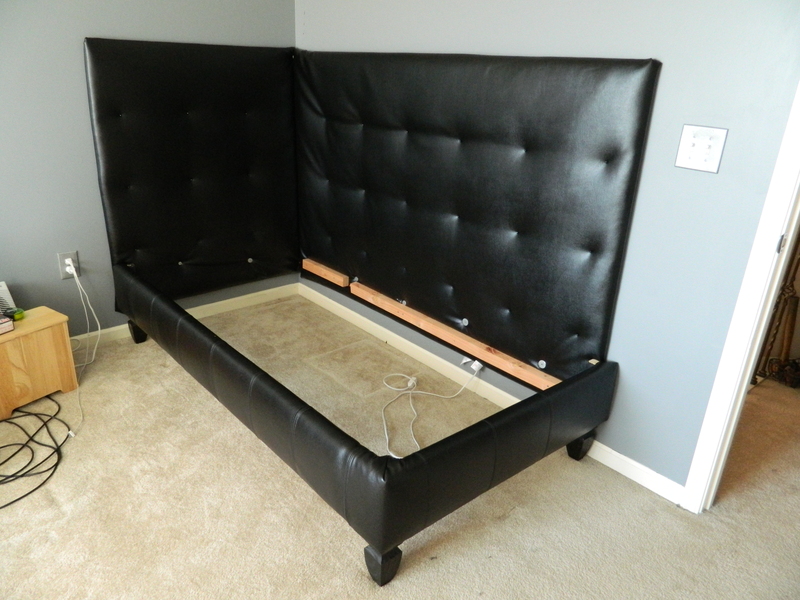 This makes the bed more stable and less likely to push the the L-shape away from the headboards. From here it was just a matter of dropping the box spring and mattress into the frame. And here we are with the bed made using his old linens. With everything that I have been doing, I haven’t had a chance to shop for new linens and a comforter. That is going to have to be something pretty spectacular considering how the room is turning out. We moved his nightstand into place and added his lamp. I need to do posts with instructions on both of these pieces. I love how they turned out. Actually, I need to do a long post about how I did the leather covering and the tufting. Everything was done by me, spending countless hours with a staple gun and glue! A little vacuuming, picking up and putting away tools and we started to move some of his computers & monitors back into the room and then we called it a good day done. 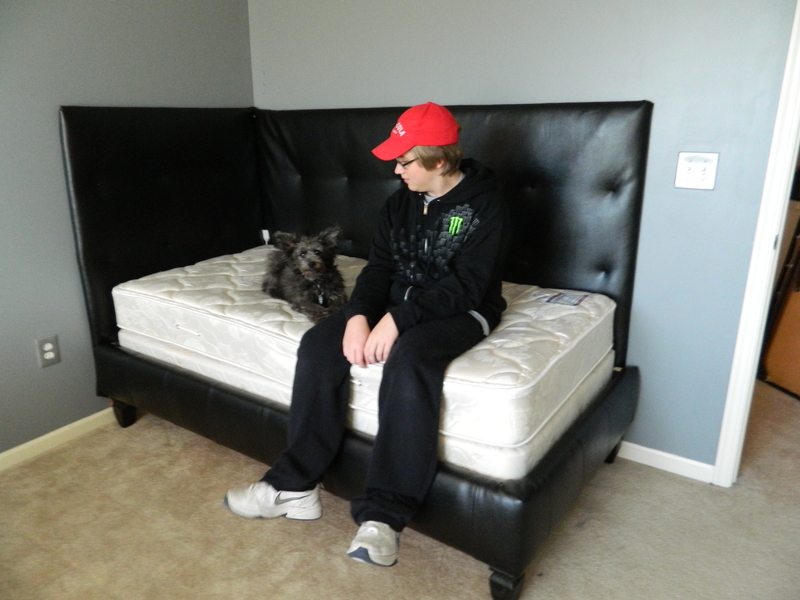 I was actually able to get the trundle and mattress he has been sleeping on back in its place and straightened up the guest room. A couple of quick shots of the desks, since it was already dark, I thought I would give it a try with taking better photos without the sunlight overexposing everything. 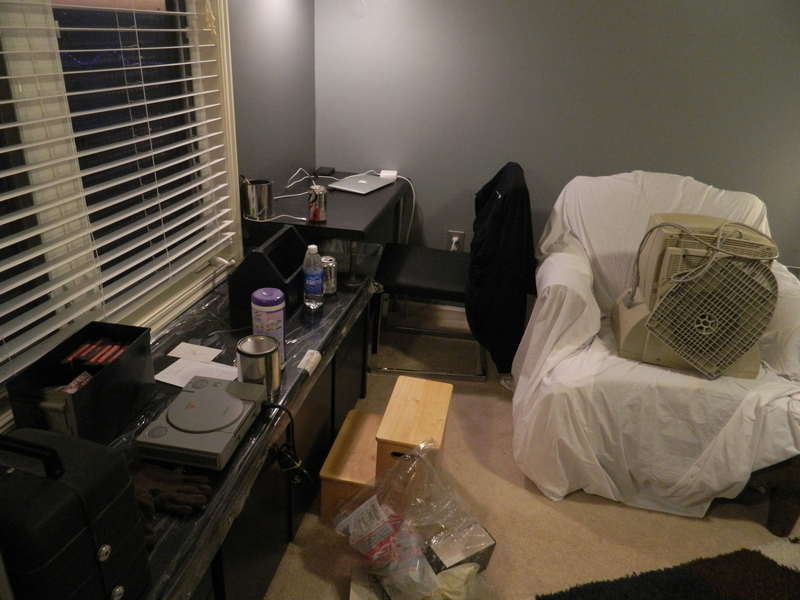 Excuse the mess, but as you can see, the room is still a ‘work in progress’, but at least I feel like we are making progress. 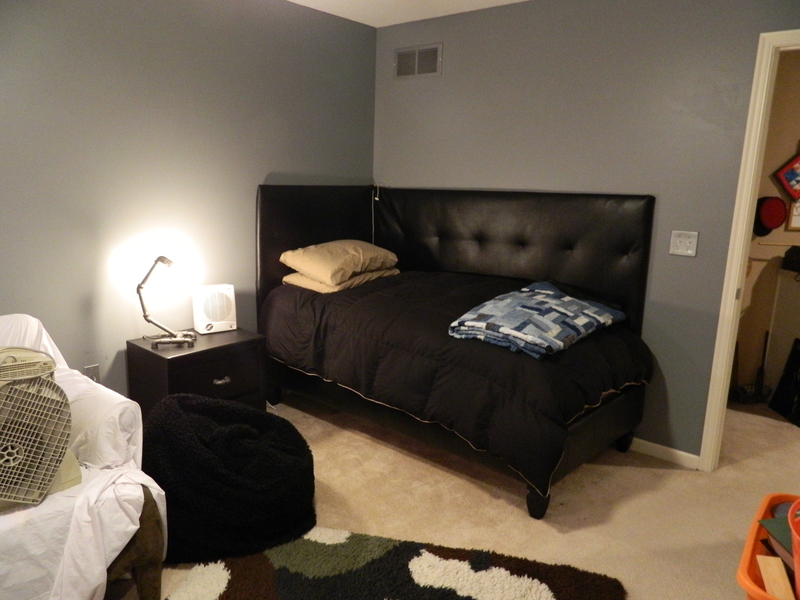 The Kid gets to sleep in his own bed tonight – which is great – and I’ve got my sewing room (where I built his night stand) and guest bedroom (which housed everything while we were working on the room) cleared and back to useful states! But mostly, I love that this is coming together for my son. He is such a joy and really likes to spend time with his Mom. I am enjoying ever minute together while he is still willing, but even better that at age 17, he is still the happy, well-adjusted boy that he is. I don’t know how I got so lucky to have such a great Kid come into my life. We also had help in the form of our dog, Ashla. The feather mattress that used to be on the Kid’s bed was a queen sized that I cut down to fit on a twin. But with the new bed, he got a new feather mattress. And once the old one was dropped on the floor downstairs, the dog has laid claim to it! I may have to figure out how to create a soft cover for it for her. Sorry about the quality of the photo, but I still had the memory card in the computer (and out of the camera), so I used my iPhone to snap this in very low light. 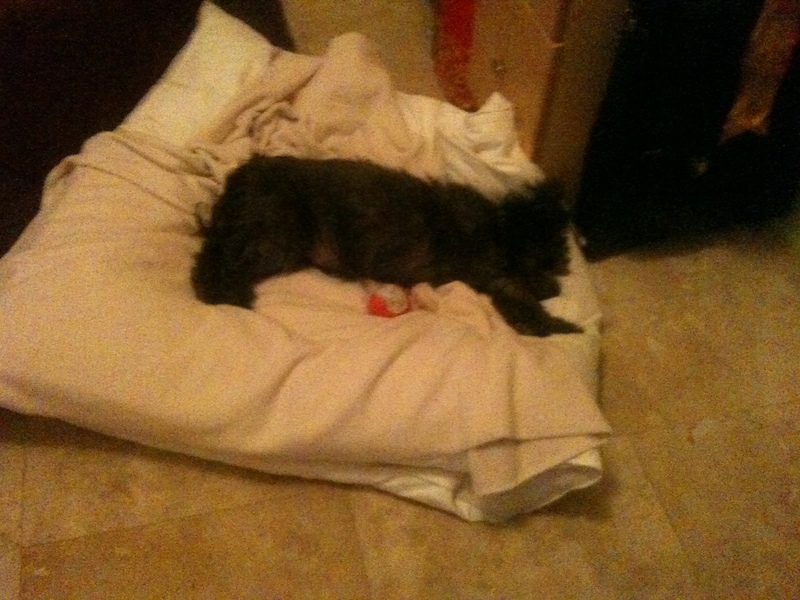 I dragged the feather mattress into the office and just had to show you a picture of the world’s most pampered pup! Well, thanks for dropping by. And Happy Crafting Y’All!